The solid fiberglass hull is laid up by hand, mixing 5 gallons of red-tinted resin at a time, layering with various woven cloth and matting. It takes 10 days to complete plus curing time. The mold (1) is one piece, with a hinge down the middle for easy removal later. 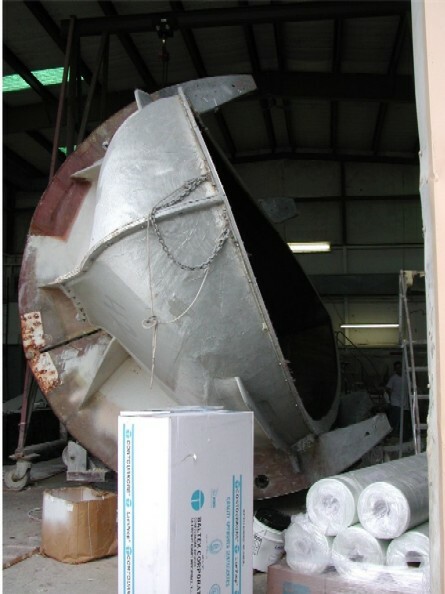 The mold rocks back and forth in a cradle to facilitate fiber glass application. Timbers (2) add strength and will be fiber glassed, and support the sub floor. Notice the wide copper strapping running along the sides for the SSB radio counterpoise. The interior (3) is built completely within the boat - nothing is prefabbed. This is light cherry wood that will be oiled later. The deck is laid up separately as one solid piece with balsa wood coring in less-stress areas. Openings for hatches, ports, dorades, etc., are then cut out according to the owner's specifications. The deck (4) is lowered and the bulkheads cut down to fit. Then massive amounts of 3M 5200 (permanent adhesive) are applied to the hull surface, so as the deck is lowered into place. The deck and aluminum toe rail are also fastened to the hull. The deck, hull and all bulkheads are fiber glassed in place. It is interesting to note that at this time NONE of the tankage, nor engine nor generator, have been installed in the boat. This is intentional - if it can all be put into the boat with the deck on, then it can be removed, should it ever become necessary, with out tearing any out. Our 9,500 lbs. 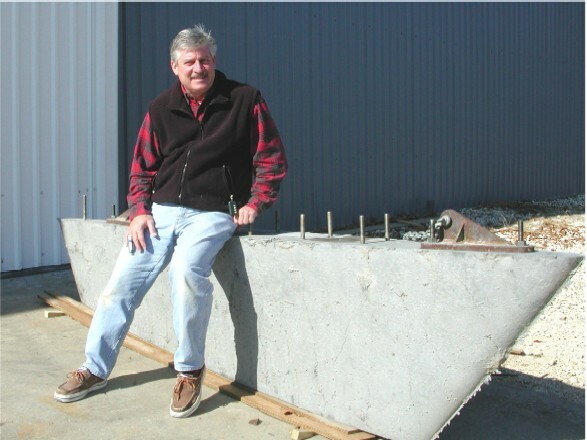 solid lead keel (5) was forged in Seattle and trucked along with our mast. 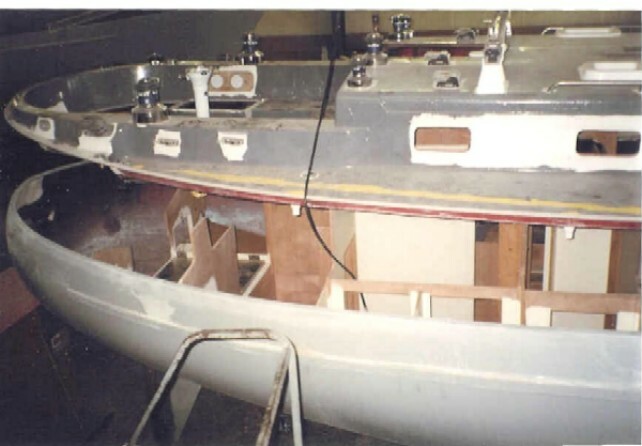 Seventeen J-bolts are used to secure the keel to the hull, in addition to 4 cases of 3M 5200 permanent adhesive. 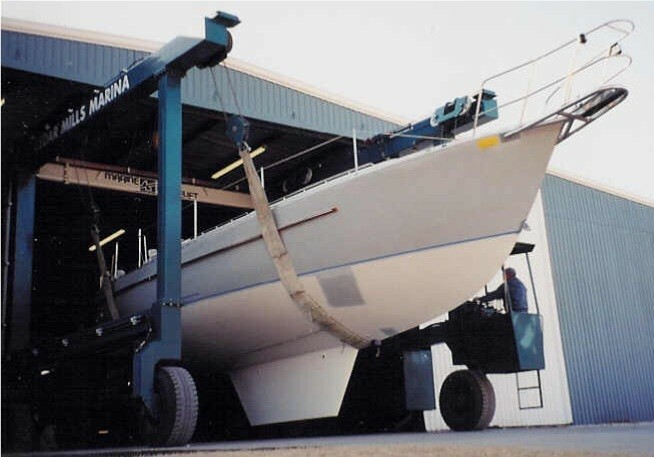 Our boat then comes out of the production shop (6) on it's way to the paint shop. It has been prepped already.